The Cabinet Committee on Economic Affairs may raise the subsidised LPG cylinder quota from 9 to 12 at the next meeting, Petroleum Minister M Veerappa Moily said. "The Cabinet note on the proposal of increasing the number of subsidised cooking gas cylinders per household annually was circulated last week, and may be cleared in the next meeting," he said. Increasing the limit to 12 would result in additional fuel subsidy burden of Rs 3,300 crore-Rs 4,000 crore (Rs 30-40 billion). The government already incurs about Rs 46,000 crore per annum as LPG subsidy. Consumers who exhaust their quota have to buy LPG at the market price of Rs 1,258 per cylinder. Subsidised LPG costs Rs 414 per cylinder in Delhi. 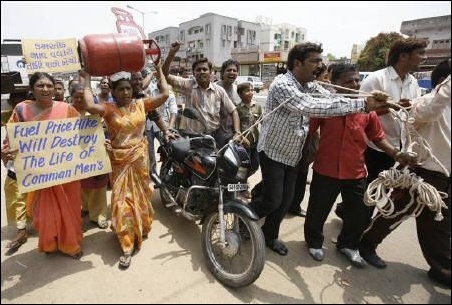 Will the quota system for LPG cylinders work?